Steve Gettle, a nature photographer based in Brighton, Michigan has done an amazing job of photographing the life cycle of a mosquito in high resolutions. 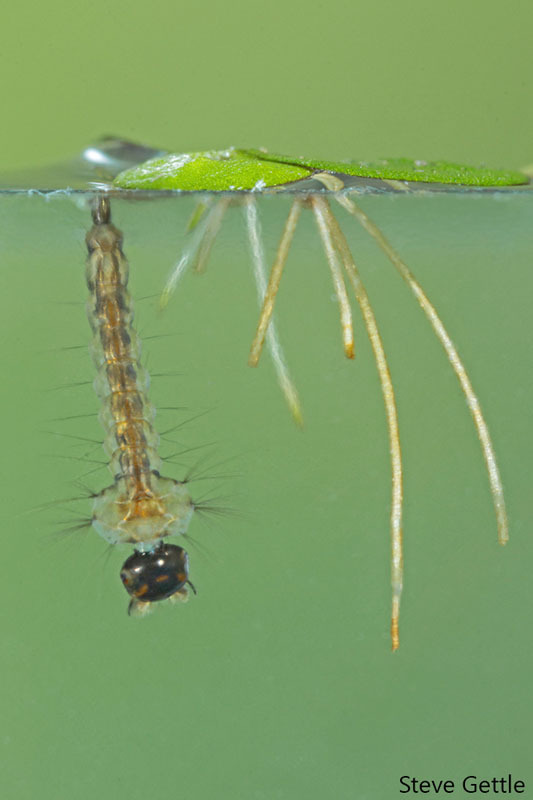 Mosquitoes start off as eggs which hatch into larvae. The larvae, also called wrigglers feed on algae and micro-organisms in the water. They spend much of their time at the water’s surface sucking oxygen through breathing tubes attached at their tail. After about a week they turn into pupae. The pupae do not feed. Like larvae, pupae spend much of their time at the water’s surface breathing through two tubes called trumpets. This stage is very much like a Butterfly’s cocoon. This is where the larvae transforms into a mosquito. If you look closely at the photo below you can actually see the eye of the mosquito of this pupae which is very close to hatching. After a couple of days the adult mosquito has formed inside. At this point the pupae unrolls flat on it’s back on the water’s surface, and the adult mosquito extracts itself from the pupal case. Once emerged it rests for a few minutes on the water’s surface allowing it’s body to harden and pumping fluid into it’s wings. Here is the whole setup used by Gettle to complete his task of photographing the hatching of mosquito. Previous articleAnatomy reveals, how giraffes keep their long neck high, without using muscles! Next articleWhat made giant dragon flies in Carboniferous?